The Fourth of July is the day Americans celebrate their independence! It is a federal holiday where many of you will be off from work, and regular day camps will be closed. Get your grilling supplies in order, make sure the pool is ready for fun and set up your outdoor tables and chairs…the Fourth of July is finally here!!! Time for some fun in the sun, or if the weather holds true to its summer ways down here in South Florida, at least enjoy being with your families and the other festivities of the holiday. Try to avoid those fruity drinks with high amounts of sugar. Instead, opt for a delicious and fresh smoothie with not only more taste, but less calories. Snack on vegetables and fruits while you await the BBQs. If you want to get really crazy, avoid the fat-riddled burgers and grill a portobello mushroom instead! Choose leaner meats like turkey burgers. Roast vegetables on your grill – not only are they good for your waistlines, they will definitely be crowd pleasers! Try asparagus, lettuce, peppers, and any other vegetable you like! Make your own potato chips! Slice sweet potatoes and flavor with a little cayenne pepper, black pepper, garlic, and onion powder and top it with a spritz of olive oil. They are a delicious snack alternative that your guests and families will appreciate. Make sure to wear plenty of sunscreen and reapply throughout the day! Check out ExpressDocs’s Instagram, Twitter, and Facebook for other delicious and healthy recipes! 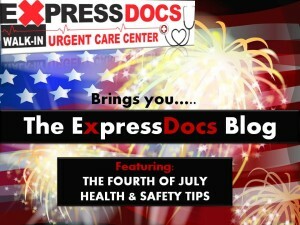 There are so many ways to enjoy the 4th of July!!! Have fun and be safe! If you have any questions or concerns. ExpressDocs Urgent Care Center is open all day today from 8am – 8pm. Come in and see a physician for any medical needs you may encounter today.